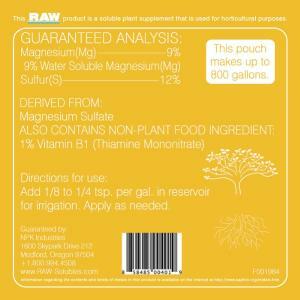 Raw B-vitamin, by NPK Industries, is a soluble plant supplement that is used for horticultural purposes. Raw B-vitamin contains 1% vitamin B1. This product contains the highest concentration of fully water soluble vitamin B1 available to the home gardener. Product also contains a 9% magnesium. Raw B-vitamin can be used at all stages of growth and flowering but is perfect for heavy stress times such as transplanting and bloom time or in drought conditions. Compatible with all nutrient and fertilizer programs.